The definition of ‘glitter goals’, this luscious liquid eye colour packs your lids with mesmerising lustre and sparkle – effortlessly. Available in eight gleaming hues (from poppy red-copper to silver-streaked amethyst), every liquid- shade is loaded with glitter and glides on seamlessly, creating hypnotic eye looks with ease, setting to a stay-put finish. Purse-friendly yet high-performing, this is everything we love about NYX Professional Makeup. 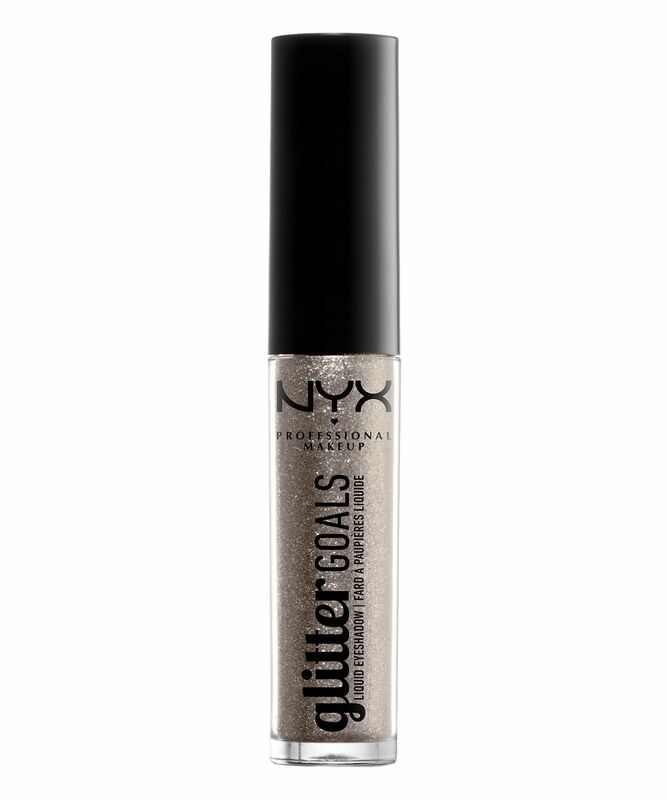 The ultimate tool for effortless party make up and eye-catching eye looks, NYX Professional Makeup’s Glitter Goals Liquid Eyeshadow will be the star in your make up crown. The lightweight formula is packed with mesmerising sparkle and is available in eight gleaming hues – copper with silver ‘Poppy’, pink with silver ‘Metropical’, champagne with silver ‘Polished Pin Up’, gold with silver ‘Industrial Beam’, pewter with silver ‘Oui Out’, bronze with silver ‘Multiverse’, black with silver ‘Imaginarium’ and purple with silver ‘Retrograde’. Each shade glides on seamlessly and sets to a stay-put finish. Glide over lids and allow to dry. Wear alone or layer over powder eyeshadow. Glycerin, Calcium Titanium Borosilicate, Synthetic Fluorphlogopite, Calcium Sodium Borosilicate, Calcium Aluminum Borosilicate, Illicium Verum Fruit Extract / Anise Fruit Extract, Tin Oxide, 1,2-Hexanediol, Sorbitan Isostearate, Dimethicone, Ammonium Acryloyldimethyltaurate/VP Copolymer, Propanediol, Hydroxyethyl Acrylate/Sodium Acryloyldimethyl Taurate Copolymer, Caprylyl Glycol, Styrene/Acrylates Copolymer,T- Butyl Alcohol, Ethylhexylglycerin, Polysorbate 60, Polyurethane-11, Acrylates Copolymer, Phenoxyethanol. MAY CONTAIN / PEUT CONTENIR (+/-): Aluminum Powder (CI 77000), Black 2 (CI 77266), Mica, Titanium Dioxide (CI 77891), Iron Oxides (CI 77491, CI 77492, CI 77499). I have Poppy Fields and it's amazing. It will survive the party but there's a problem with application – sometime there is some kind of weird chunks that you have to mix with the formula. Unfortunately, because of this you can mess up you eye-shadow look a little bit. Anyway not such a big deal and I definitely recommend this glitter.